Drexel Writers Room and Drexel Smart House hosted their second event Jan. 26 in the series of public talks and guided writing workshops at the Dornsife Center for Neighborhood Partnerships. 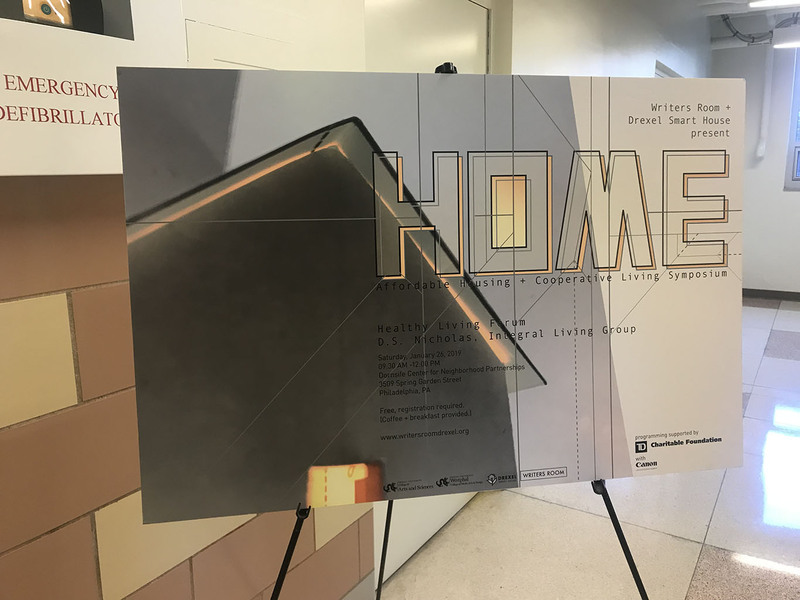 The event, which was part of the Healthy Living Forum, was called “HOME: Affordable Housing + Cooperative Living Symposium.” It explored the home and how the spaces within our homes affect us. The forum began with a short lecture by D.S. Nicholas, the director of the M.S. 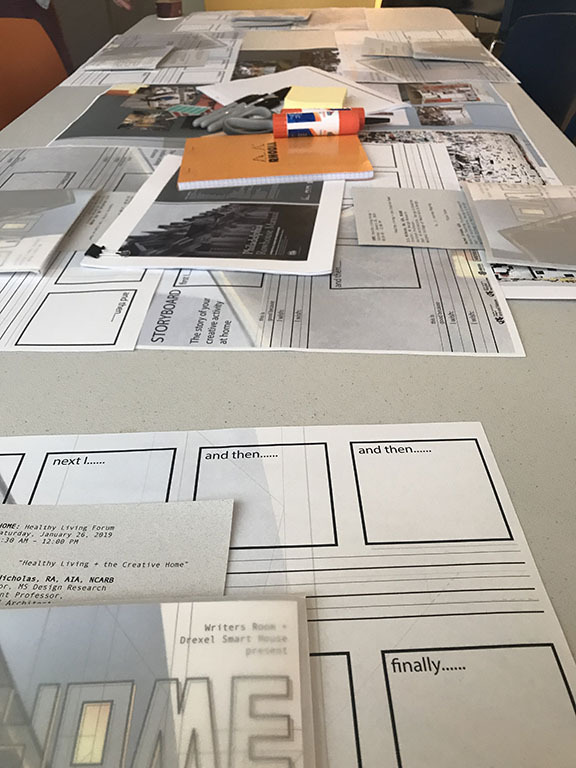 in Design Research program at Antoinette Westphal College of Media Arts and Design and an assistant professor in the Department of Architecture Design and Urbanism. Nicholas, who is also the leader of the Ingregal Living Group, spoke of the group’s efforts. After the introduction, Nicholas talked about how we all may have some preconceived notions that creativity can be messy and take up a lot of space. “I think that one of the goals today is to kind of uncouple your creative activity from what you see as the physical barriers and allow you to find a place where you can do that within your environment,” Nicholas stated. Guests were invited to work on a storyboard of their creative activity at home. Nicholas shared a list of activities. Some of the creative activities listed surprised guests, such as organizing and parenting. The symposium included flash talks by Rachel Schade, Yvonne Michael, Gina Lovasi and Uk Jung. Schade is an associate teaching professor in the Department of Architecture Design and Urbanism at Westphal. She is also the author of Philadelphia Rowhouse Manual. Schade gave a brief history of the rowhouse structure in Philadelphia and even included a picture of her own creative space. After Schade, Michael, an associate professor in the Department of Epidemiology and Biostatistics in the Dornsife School of Public Health, spoke. Michael discussed research that she had been doing for ten years on trees and health. She spoke on the history of thinking about trees and how they can improve our health. She also mentioned the emerald ash borer and its impact on ash trees in the U.S.
Lovasi was the third flash talk in the forum. She is the co-director of the Urban Health Collaborative. She is an associate professor of Urban Health in the Department of Epidemiology and Biostatistics in Dornsife. Lovasi talked about what is in the air we breathe and the alternatives for improving urban air quality. The final speaker was Jung, an adjunct professor in the Department of Architecture Design and Urbanism at Westphal. Jung is an alumni of the architecture program at Drexel. One thing he spoke about in his talk was his interactive projected map of Mantua. He played a short video for the audience, which illustrated his discussion about the projected map. “I had a model of Mantua and I actually projected visual information. I hope to have a complete model of Mantua and have it project information and stories on top of that,” Jung explained. The last part of the event involved thinking about how creative spaces might change in the future. Guests were given a blank postcard and were asked to write a letter to their future selves. It was suggested that the postcard should represent their hopes for how creativity might be used in the future. The third HOME symposium will take place in April.